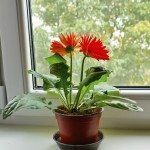 My Berbers daisies are growing beautiful new leaves but have had only 2 flowers. Where are the blooms? It is in afternoon sun, kept watered and has been fertilized. Looks healthy with lots of new leaf growth, but no blooms! The fertilizer may have given to much Nitrogen to the plant. This will cause lots of lush leaves and few to no flowers. You can correct with Phosphorous, Bone Meal is a good source.